This is meta from Cupcake Queen SB. 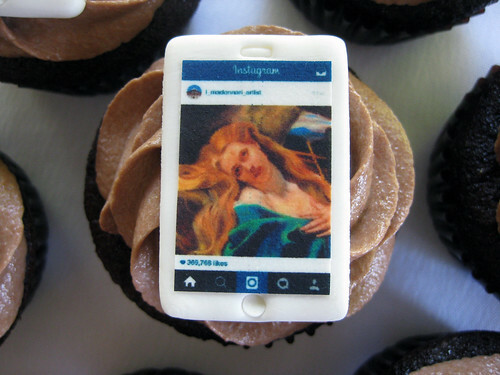 A photo of a piece of art posted on Instagram is then printed with edible ink and topped on a chocolate cupcake with Nutella buttercream frosting. Image printed on icing sheet with edible ink, on fondant. Gluten-free cake recipe from www.elanaspantry.com. Frosting recipe from Shugary Sweets: bit.ly/1ArG5s4. Art by Lorelle Miller. Photograph of art by Thomas Jacob. The original art is a pastel chalk street painting 12 feet high, done at the I Madonnari Street painting festival at the Santa Barbara Mission. I mention this because the work goes from being so large a ladder is needed to photograph it, then is made small enough to go on top of a tasty cupcake!